A genetically modified salmon was first developed in 1989 using an antifreeze protein-based technology under license from the University of California at Berkeley. The company was originally incorporated in 1991, under the name A/F Protein. It was 1993 before AquaBounty sought regulatory guidance from the FDA and 1995 before it initiated its application to commercialize. In 1996, A/F Protein acquired a license to the AquAdvantage technology from the University of Toronto and Memorial University of Newfoundland, and was subsequently reorganized in 2000, into two separate entities: A/F Protein, which retained the antifreeze protein technology; and, AquaBounty Farms, which obtained the AquAdvantage technology. The fish grows at about twice the natural rate, reaching maturity in 1 1/2 to two years. Both conventional and the AquAdvantage salmon are the same size when fully grown. AquaBounty Farms, headquartered in Maynard, Massachusetts, changed its name in 2004 to AquaBounty Technologies. In 2006, it was listed in the London Stock Exchange’s Alternative Investment Market (AIM) raising $28 million in an initial public offering of stock. In October 2010, businessman Kakha Bendukize, the former economics minister of Georgia, became the largest shareholder. Intrexon Corporation, a synthetic biology company owned by biotech billionaire Randal J. Kirk, acquired all of Bendukize’s shares in October 2012, which amounts to a 48 percent interest in AquaBounty. Intrexon now holds about 62% of AquaBounty shares. Q. With AquAdvantage Salmon growing much larger than other salmon, could they gain a mating advantage or out-compete native salmon for food or space? A. No. 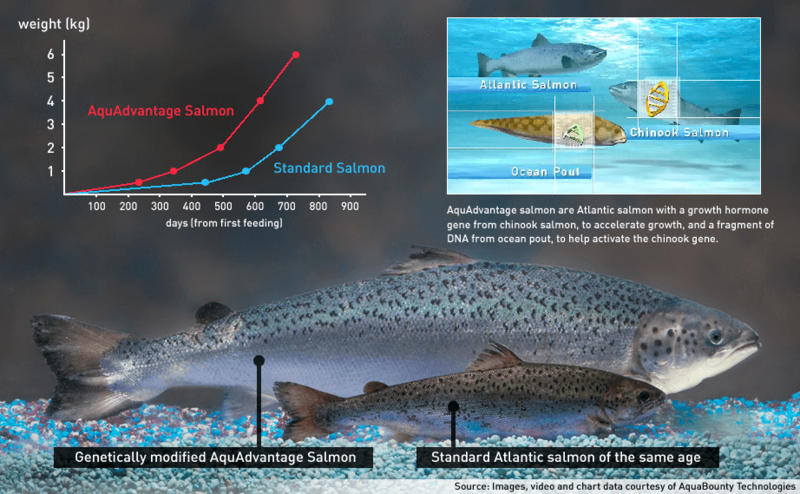 AquAdvantage Salmon grow faster in early life stages than other salmon but they do not grow larger than Atlantic Salmon. Male salmon do not gain a mating advantage because of size. In fact, “precocious parr,” (only 6 inches in length), father about one-fifth of each new generation before they go to sea. 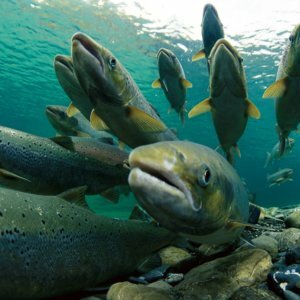 Studies of escaped farmed salmon, which are almost always larger than wild fish, have found them to mate successfully only 16 percent as often as native salmon. Farmed salmon are fed on small, dry pellets similar to those fed to other farmed livestock and pets. If they escape, they are generally not adept at finding new feed. More than 85% of the farm escapees caught off British Columbia and Alaska were found to have no food in their bellies and are probably more exposed to predators themselves. Q. Researchers at Purdue University have raised concern by reporting that wild salmon population could be driven to extinction by relatively few AquAdvantage® Salmon. If these salmon were to breed successfully with native fish, will their novel gene ‘escape’ into the wild gene pool and alter native salmon populations? A. Muir and Howard, the Purdue scientists who proposed the “Trojan Gene Hypothesis,” did not study AquAdvantage Salmon. They designed a mathematical model based on the behavior of Japanese medaka, a small freshwater fish that matures in 56 days and breeds daily until it dies. Salmon take three, five and even ten years to mature and most breed only once in their lifetimes. AquaBounty has further stipulated that it will market only sterile, all female AquAdvantage® Salmon. Since these fish are unable to reproduce, there can be no gene flow to wild salmon. As a further precaution, AquAdvantage® Salmon will be reared in physically contained facilities, similar to those used in the commercial trout industry. AquAdvantage® Salmon will thus be raised with redundant biological and physical containment, mitigating any potential risk of a negative impact on genetic diversity of wild stocks. Q. Can we be sure that AquAdvantage Salmon will really be sterile? A. Yes. There are specific tests to establish the effectiveness of our process to produce sterile fish. These tests will be performed on every commercial batch of fish to assure our product meets our specifications. Q. 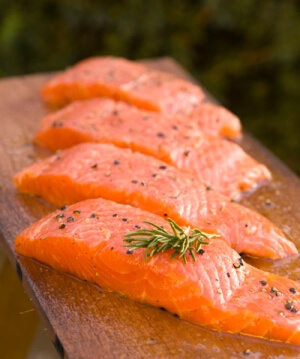 Do AquAdvantage Salmon produce antifreeze proteins and excessive amounts of growth hormone? A. No. AquAdvantage Salmon produce no antifreeze proteins. Only the promoter, the molecular “switch” from the antifreeze protein gene is used. AquAdvantage® Salmon produce the exact same growth hormone as wild-type Atlantic Salmon, and there is no increase in the level of this protein as compared to wild type salmon. Q. Are there federal laws that govern the regulation of genetically engineered fish and marine organisms grown for human consumption? A. Yes. AquAdvantage Salmon are regulated by the Center for Veterinary Medicine under the Food, Drug and Cosmetics Act. 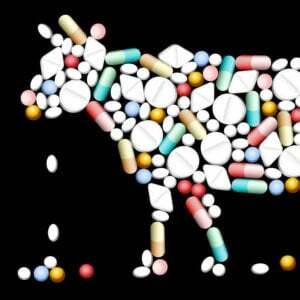 As far back as 1986, the U.S. Food and Drug Administration (FDA) asserted jurisdiction over genetically engineered animals and fish on the grounds that the transgene and any expressed proteins, affect the “structure and function” of the receiving animal analogous to the modalities of veterinary drug formulations. FDA jurisdiction has been upheld by the federal courts. Q. Wasn’t the 1986 federal “Coordinated Framework” a political stratagem of the Reagan administration to exempt biotechnology from regulation? A. No. The Coordinated Framework (51 Fed. Reg. 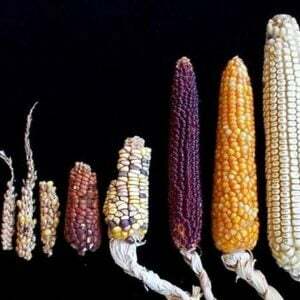 23303) asserts the scope of well-established statutory authorities to include, rather than exempt, products produced by modern biotechnology within traditional regulatory jurisdictions. Recognizing that individual products, and not the processes by which they are developed, are the ultimate source of risks and benefits and the focus of regulatory action, the Coordinated Framework clarified the existing authority of FDA, the Environmental Protection Agency and the Department of Agriculture to regulate biotech plants and animals under the established jurisdictions of the Food, Drug and Cosmetics Act (FDA), the Federal Insecticide, Fungicide and Rodenticide and the Toxic Substances Control Acts (EPA), and the Plant Pest Protection, the Plant Quarantine and the Virus, Serum and Toxin Acts (USDA). The scientific rationale in support of the product-based focus of the Coordinated Framework has been endorsed in three separate reviews by the National Academies of Science, in 1989, 2000 and 2002. The regulatory rationale in support of the Coordinated Framework was reviewed, evaluated and endorsed by the Clinton administration in 1999-2000. Q. Does the FDA evaluate the environmental impact of advanced-hybrid fish or does it limit any assessment to the molecular attributes, pharmaceutical effects or the impacts of any chemicals used in the engineering process? And does their environmental risk assessment extend to potential ecological impacts? Q. Does the FDA possess the expertise in fisheries biology, ecology and environmental science to assess the environmental risks of advanced-hybrid fish? A. The FDA staff includes specialists trained in biology, environmental science and risk assessment who have conducted hundreds of environmental impact assessments. Each assessment is based on the explicit assumption that the ultimate repository of agency-approved pharmaceuticals or food additives will be aquatic ecosystems following their production, use or disposal. NEPA and CEQ require federal agencies to cooperate with other affected agencies in the assessment of the environmental impacts of agency actions. Q. Is science-based risk assessment adequate for the evaluation of the environmental impacts of biotechnology? A. Science-based risk assessment identifies potential hazards, quantifies the probabilities those hazards will occur and accounts for uncertainty with significant safety thresholds – typically set at 1000 times the likely level that a risk will occur. This approach is wholly compatible with precaution. The science-based process, according to a former undersecretary of Commerce in the Clinton administration, David Aaron, has “shown us that biotech foods developed and used in the U.S. present no safety risk beyond those of their ‘natural’ counterparts. 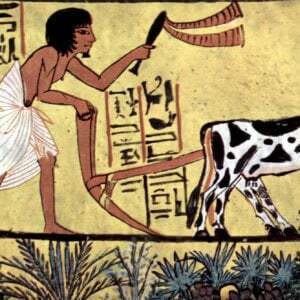 Not a single ailment has been attributed to biotech foods”. Similarly, environmental scares ranging from Monarch butterfly impacts to increased pesticide use to advanced-hybrid superweeds have all been disproved by adequate research or avoided by appropriate agricultural practice or regulatory standards. The Precautionary Principle as adopted in the 1992 Rio Declaration calls only for “cost effective measures to prevent environmental degradation” when “threats of serious or irreversible damage” lack “full scientific certainty.” U.S. risk management practice meets this test.